Your favorite BestSelling authors have been working hard to feed your hunger for great new books in every genre. Here are some of the latest releases over just the past two months to feed your need for great reading. Barb Drozdowich has updated her Complete Mailing List Toolkit for 2018, with a free video course on using MailChimp and Mailerlite. This bundle of four books provides strategies for list building and step-by-step guidelines for creating content that turns readers into lifelong fans. Toby Neal’s sixth Paradise Crime book, Wired Justice, hit the stands two days ago. Sophia Ang, her lovable dog Ginger and her dynamic partner Jake Dunn plunge into a new investigation to find a missing young woman—the latest in a string of disappearances. Toby has also re-published the previous five Paradise Crime books with all new covers. J.L. Oakley‘s Hilina Pali, her third Lei Crime Kindle World novella, brings back Auntie Bee Watanabe and her niece, ace crime reporter Wendy Watanabee. Auntie Bee receives mysterious clues pointing to an old injustice. Bee and Wendy team up with a local historian in a race against time to prevent another tragedy from happening at Hilina Pali. In DelSheree Gladden’s third Eliza Carlisle Mystery, Instigator, Eliza finds herself in a series of embarrassing, injurious and rat-filled situations, and a murder investigation. In A New Goddess, Autumn Birt ends the epic fantasy Games of Fire series with a struggle for power over the elements of magic, and over life and death on Earth. D.G. Torrens’ Abyss is a collection of thought-provoking poetry and prose. The words are like sutures, healing from the inside-out. Abyss takes the reader on a journey through loss, grief and rejection to healing. Last week, an iconic performer and poet passed away. And about a year ago, one of BestSelling Reads’ founders, the multi-talented Kathleen Valentine passed away suddenly. Kathleen was in charge of the Monday Musings for a long time, and she was known to publish the words of significant poets on this blog — like Bob Dylan, for example. 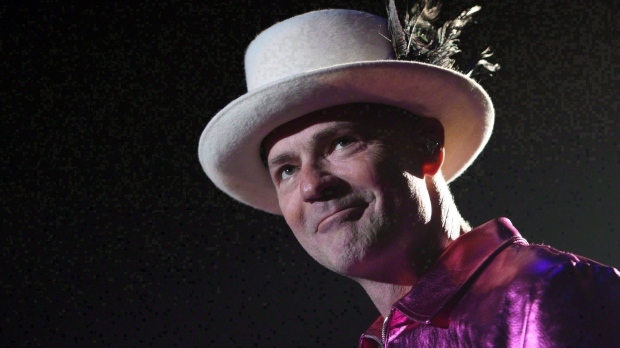 Gord Downie, the front man and the principal lyricist for the Canadian band, The Tragically Hip, passed away after a long battle with brain cancer. It was something every Canadian knew was coming, and yet something, in the words of our Prime Minister, Justin Trudeau, that we all wished would not happen and that still hurt deeply when it did. One of the unfortunate aspects of the career of Gord Downie and The Tragically Hip was that they never really broke through in the U.S. market, unlike many Canadian musicians like Céline Dion, Bryan Adams, Jonie Mitchell or Shania Twain. And yet, perhaps it’s Downie’s poetry that citizens of the U.S. need to hear. In the spirit of Kathleen Valentine, then I’d like to present some words of Gord Downie that perhaps American (that is, citizens and denizens of the U.S.A. — after all, I’m and American, too, as are Mexican President Peña Nieto and Brazilian poet Braulio Tavares). Me debunk an american myth? Where the great plains begin. Do you know some poets that Americans need to learn about? Leave a comment. This week’s focus is on Rachel Thompson’s new boxed set, which includes both her award-winning Broken Pieces and the follow-up collection of poems and essays, Broken Places. Within one week of its release through Booktrope, Broken Places reached the Top Five in Women’s Poetry and #1 on Amazon’s Hot Releases List. In it, Rachel courageously confronts the topics of sexual abuse and suicide, love and healing, in her second nonfiction book of prose and poetry (her fourth book overall). Rachel bares her soul in essays, poems and prose, addressing life’s most difficult topics with honesty. As you follow one woman’s journey through the dark and into the light, you will find yourself forever changed. Sign up for her Author Newsletter and her BadRedhead Media Newsletter. And follow her on Twitter @RachelintheOC and @BadRedheadMedia. Rachel Thompson aka RachelintheOC is a published author and social media consultant. Her books A Walk In The Snark, The Mancode: Exposed and Broken Pieces are all #1 Kindle bestsellers! When not writing, she helps authors and other professionals with branding and social media for her company, BadRedhead Media. She hates walks in the rain, running out of coffee, and coconut. Not just an advocate for sexual abuse suvivors, Rachel is the creator and founder of the hashtag phenom #MondayBlogs and the live Twitter chat, #SexAbuseChat, cohosted with certified therapist/survivor, Bobbi Parish. and her consulting business @BadRedheadMedia.